Key Difference: Carpets are wall to wall style of floor treatment and need professional help for installation or removal. A carpet requires constant attention, such as vacuuming and requires profession cleaning in case of extensive damages. Rugs on the other hand are smaller carpets that only cover a portion or an area of the floor and not the whole thing, also earning them the name of area rugs. Rugs are also easier to move, clean and do not require professional help for installment. Rugs and carpets are interchangeable in many countries, primarily in Asian countries. To most people carpets and rugs are the same, but this is not the case. They both serve different purposes in a home. Carpets and rugs are floor coverings that are used for style, warmth and comfort. Carpets are wall to wall style of floor treatment and need professional help for installation or removal. After a carpet is installed, no other flooring is visible underneath the carpet. A carpet requires constant attention, such as vacuuming and requires profession cleaning in case of extensive damages. Rugs on the other hand are smaller carpets that only cover a portion or an area of the floor and not the whole thing, also earning them the name of area rugs. A rug must cover less than 40 square feet area of the room in order to be classified as a rug. Rugs are also easier to move, clean and do not require professional help for installment. Carpets and rugs are made of similar materials such as nylon, polypropylene, wool and wool-blends, polyester and acrylic, but their designs and textures differ. While carpets made to be thicker and in large quantities, they are mostly machine made and only have select designs and patterns, while rugs can also be handmade and have various designs along with depicting historical scenes. Rugs can also be hung up on a wall. 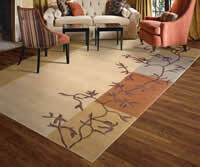 Rugs are expensive compared to carpets and are more delicate in nature. Carpets are thicker compared to rugs and have a more luxurious feel to it. Carpets are also treated with stain resistant chemicals, while rugs are not. Rugs can also be passed on generation to generation and can be taken with you when shifting houses, which is not possible in case of carpets.